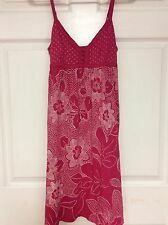 You are bidding on Aeropostale Womens Size Small Sleeveless Dress that is Polka Dot and Vneck. The straps are adjustable. The length is just above the knee. There are no holes rips or stains. Comes from non smoking home. Check out my other listings of namebrand clothes. The fabric is 100% cotton. It is a size M and is in good used condition with minor wear. We will make every attempt possible to resolve the issue if we made a mistake. Great to wear for any casual occasion. Style - Fit and Flare, Knee Length. Cute n Comfy! Shoulder Width (shoulder to shoulder) - 11". Total Length (top of collar to bottom) - 30". Sleeve (Shoulder seam to end of sleeve) - 1". We also cannot cover or back any manufacturer defects; however, we are always here and happy to help you with any issues you may encounter whatsoever! Machine wash. Color Gray w/blue sleeve stripes. Great condition and very flattering dress. Length (top shoulder to him): 34". Chest: 16". Measurements were taken with clothes laying flat, and are approximate. Measurement Breast: 16" Length: 31" Good condition no stains or rips. We offer combine shipping! Thank you for your interest, please check out our other items in our store. Have a great day! Just above knee length. Worn once. Scoop neckline and scoop back. Short sleeves. Knee length (depending on height). Size XS/TP. Preowned and in excellent condition. Top of shoulder to bottom of dress: 32". Top of sleeve to bottom of sleeve: 4". 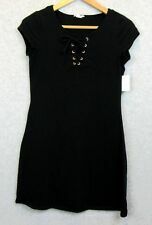 Women's Aeropostale summer little black dress spaghetti strap new! I source out the best clothing for you guys! MATERIALS: 60% Cotton, 40% Polyester. Color: Green / White Floral Print. Length: 36". With the item laid flat. No holes or stains anywhere on this dress. Sleeve length is 18". Sizes do tend to vary by manufacturer. Care: Machine washable. Color: Burgundy/Gray. Condition is Pre-owned. lined with check gauze. 22" across chest. 19" across waist. If you are unsatisfied, we are unsatisfied! We take all of our own pictures. The item(s) pictured is exactly what you will be receiving. Underarm to bottom- 26". Size large. The dress has lining. The lace is beautiful and looks very feminine. Skirt length (back) 21". Skirt length (front )16". I wore once on a friend's wedding. Shell : 76% cotton, 24% nylon. The dress is hi-lo style. BUST 27 IN AND LENGTH 33 IN. 95% Cotton & 5% Spandex. Sleeve length (top of shoulder to end of sleeve) = 0" & Chest (underarm to underarm) = 13.5" & Length (Top of item to bottom of item) = 26". 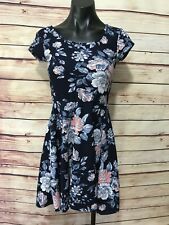 Aeropostale floral print summer dress never worn, with tags! Super pretty summer dress from Aeropostale. Cute cut outs in the back to show skin and designs on the front to draw attention to figure. Very light and perfect for hot weather! Great summer color, size medium, worn a handful of times, very comfy! Smell hem tear shown in pics. Smoke free home. See other listings for shipping discount! 100% Cotton. Back Top to Hem 30". Scarletts Trends.